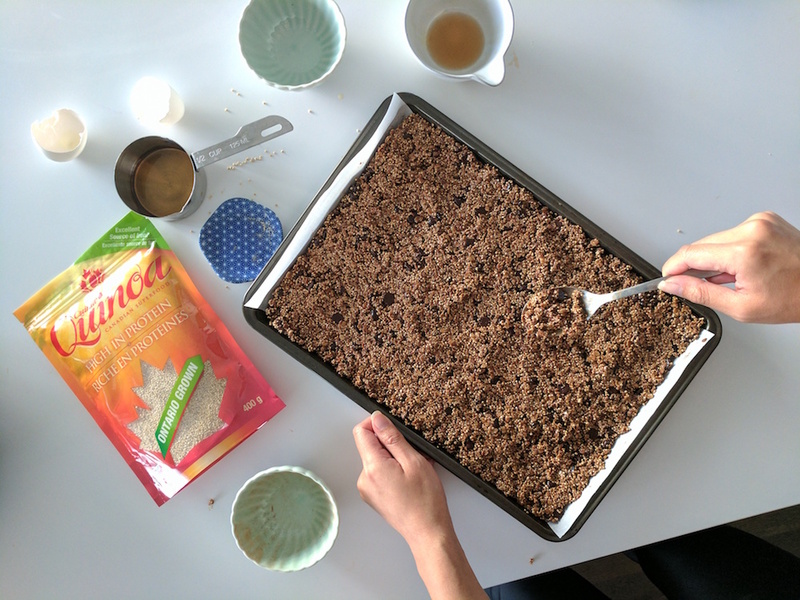 In a medium mixing bowl, add oats, Quinta Quinoa, cacao powder, flax seed, chocolate chips, salt and mix. In a small bowl, whisk the egg and add maple syrup, oil and vanilla extract. Stir to combine and pour into a bowl with dry ingredients. Mix thoroughly and spread in an even layer on prepared baking sheet. Bake on a third rack from the bottom for 30 minutes. Remove from the oven and let cool for an hour. After break into pieces and enjoy with Greek yogurt, as a cereal or as a snack. Store in a glass jar in a cool dry place, for up to a month.